Easy to pick up, impossible to put down. UNO is number one for family fun. Race against your opponent, who can complete the pattern first. Great for fine motor control, visual discrimination and concentration. Slot in the sticks, drop in the balls. When it's your turn pull out a stick and try not to let any balls fall. Your preschoolers first boggle game. With boggle Jr your preschooler will transform letters into words, 2 different matching games encourage various skills and levels with fun and colourful pictures. Hungry Hippos Game is action-packed fun that's different every time you play. The brightly coloured game board, vivid marbles and funny hippo characters will inspire laughter and fun as you join your friends in this frantic, hippo-feeding game. Launch the marbles into the centre pond and get ready for the eating mania to begin. If your hippo chomps the most marbles, you win the game. You can also play to win by being the first hippo to chomp the golden marble. Convenient marble-storage feature and easy to store parts help make clean-up a snap. The following skills are learnt: digital and analog, time-telling, memory and concentration, all while having loads of fun. Two levels of play so suitable for beginners and more advanced. The ridiculous mouthpiece challenge game. Can you guess what your partner is saying while they are wearing their mouthpiece. Monopoly Deal is all about collecting properties and stealing from your opponents! Use Action cards to charge rent, swap cards, demand birthday money and lots more. Make sure you put lots of money into your personal bank - and remember other players will steal from you too! It's like monopoly on speed, games last only about 15 minutes so there is definately no time to get bored. 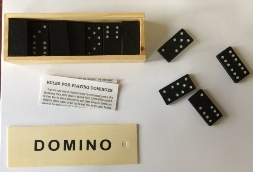 Dominoe set in a wooden box with instructions, easy travel game ideal to pop into your handbag and keep everyone busy while you wait for the food at your favourite restaurant. Knowledge box is designed to improve children’s observation,memory and language ability. Each card has information about it’s subject. Children get 10 seconds (by using a timer) to study the card, then they get asked a question on what they saw. If they get the question right they keep the card. The winner has the most cards at the end of the game. How many items can you fit on the camels back before he bucks it all off? The classic head to head strategy game, also known as battle ships. Take control of your sea battle and get ready as you call the shots and take the hits. The first player to take out his opponent wins. How much treasure could you take? Have you got the skills to complete your sets? Connect Four is a two-player connection game in which the players first choose a color and then take turns dropping one colored disc from the top into a seven-column, six-row vertically suspended grid. The pieces fall straight down, occupying the next available space within the column. The objective of the game is to be the first to form a horizontal, vertical, or diagonal line of four of one's own discs. Can you get from start to finish without buzzing the wire? "Slammer is fast, exciting and full of fun! Listen to the sound coming from the randomizer and try to grab a pair of cards matching with that sound – with both sides of your slapstick. You have to be quicker and more sharp-eyed than the other players, because everybody is trying to grab the correct pair of cards and the randomizer keeps on playing new sounds at short intervals. 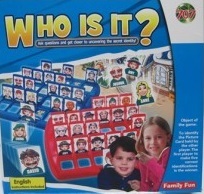 The player who collects the most pairs during three rounds of slamming and grabbing wins the game!" This game is similar to the classic Ker Plunk. Players drop plastic monkeys through the hole in the top of the clear plastic "tree". Several colored sticks are skewered through the tree trunk to keep the monkeys from dropping. Players roll a die and must remove a stick of the same color rolled. Be careful when choosing a stick. You must keep each monkey that drops during your turn. The player with the fewest monkeys when they've all dropped is the winner. 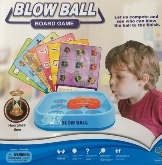 Compete to see who can blow the ball to the finish first. 3 x double sided game cards included to make the game different and more fun. Also includes 2 balls and 1 hourglass. Perfect for mouth strength, helps with speech development. Place the monkey on the home base, turn him till his banana is pointing to the picture you wish to match. Now guess which pictures is it’s match from the pictues on the other side. Then place the monkey on the 2nd home base and let him go. Watch him spin around and magicall point to the correct answer. WOW!! The fun way to learn simple matching. Improves reasoning skills and manual dexterity. Can be placed alone or with others. Contains 5 2 sided matching sheets, totalling 120 matching options, including rhyming wods. Animal homes, occupations, seasonal fun, colours, shapes, letters, opposites and what belongs together.